Thanks for checking this project out and i hope to pique your interest! To get access to to the most recent version of the demo check out the discord link at the bottom. We appreciate any and all advice or criticism as we have quite a long journey ahead of us! 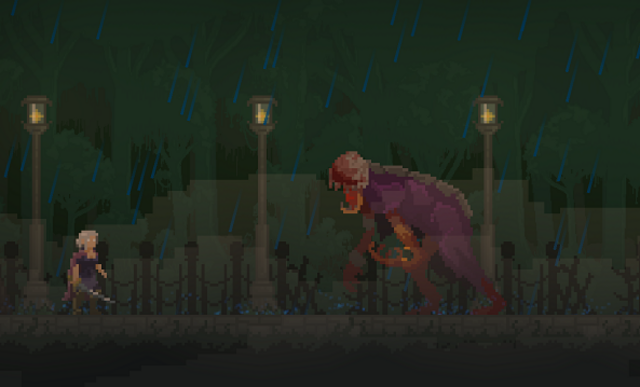 2D Metroid-vania with a heavy combat focus set in a Victorian time period filled with classic monsters and eldritch horrors. Purity of Blood (working title) Is a 2D, Metroid-Vania, platformer with a heavy focus on compelling exploration and hack-and-slash style combat. It features a character driven story which takes place in a Victorian era setting populated by Transylvanian folklore creatures as well as eldritch Lovecraftian horrors. 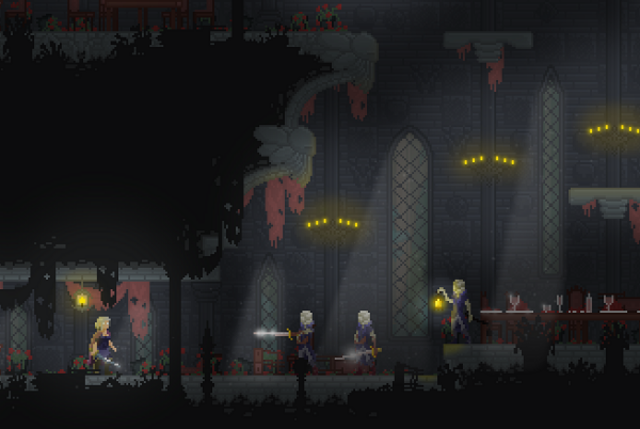 The game largely takes place in a huge mysterious manor and the surrounding areas once inhabited by a grand society of vampires now brought to ruin by eldritch forces. The protagonist and her brother set off for the manor in search of their mysteriously disappeared father all the while learning about the true nature of the manor and the protagonists vampiric birth. The project is certainly still in early development and a strict timeline is hard to formulate given the variable scope of the projects and the team size. That being said once the team is finalized we will produce a concise release window accounting for risk, manpower and funding. Details on the finances behind the project can be found below. Framework and partial implementation of projectile weapons, spells and abilities. A functional arena which can actively tweak arena room, enemy type, enemy data, presence of platforms/grappling hook points and more. 5 enemies of varying archetypes: fodder enemy, duelist, flying, huge and caster; each with varying attack sets, movement patterns, animations and AI. Basic implementation of graphical effects like dynamic rain, dynamic fog, parallax layers, dynamic lighting, bloodstains and particle systems. We wish to attract more talent, build a wider audience and develop channels for feedback. A form of "create your own combo” adaptability wherein the player can emphasize their preference of high damage and stagger vs high speed as well as other factors such as special effects and range. The depth of this would be dictated by time, overall game cohesion and development cycle additional attacks becoming available as the player uses a particular weapon/progresses. Focus on timing/quick thinking as well as "right tool for the right problem". a “base” featuring shops and NPCs of various purposes. atmospheric victorian era aesthetic which become more and more eldritch as you progress throughout the game as well as return to previous areas. Scales heavily with development pacing and game cohesion. Choices the player makes determine how vampiric they become, influencing their powers and the world around them. choices the player makes would potentially incur the scorn of other characters, introducing new story elements, encounters, boss fights and endings. Currently we have 2 artists on board but we are still looking for more talent! The game does utilize a pixel art aesthetic so examples of pixel artwork are desired. Requirements are that you have some form of portfolio with at least 4 original creations. At the moment we have one programmer. A large amount of code has been done for the games framework though there is more to be done. Some examples of prior work/training are desired. In a base sense it is the expectation that all staff would be fluent in Game Maker Language (GML) and be capable of utilizing a wide variety of scripting techniques as well as familiarity with Game Maker Studio 2 (GMS2). Bonus points for skill in using shaders. Note: If you are unfamiliar with GMS2 but have experience with GMS1 that is not a problem, there aren't really any earth shattering changes. That being said if you don't own a copy of GMS2 and are unwilling to purchase it then collaboration would become somewhat more difficult, though this is not an absolute requirement. Audio and sound design is virtually non-existent at this point with only a few placeholder sounds. For now this isn't a huge necessity but we are certainly looking for people to get in early. At the end of the day it is likely that this would be done entirely through contracting rather than staffing. Still if you are skilled in audio engineering feel free to let us know and we will keep you in mind as we go. Peripheral roles like legal, localization, management etc. are not needed as of yet though they may become desired later down the line. If you believe you have a valuable skill and would like to contribute, as with Audio and Sound design, let us know and we will keep you in mind. Note: I am certainly also open to more input into the game from team members in the form of gameplay/story ideas/criticisms and play testing. The main motivation for the creation of this project is portfolio development and a general passion for games. Finance, in a nutshell, is very undecided. There are many unknown factors and we have no large capital to speak of. Payments for team members will be minimal/null for the time being. That being said, we are hoping that crowdfunding support will become relevant at a later time. This would be after we have a playable “vertical slice” ready to present publicly or potentially even earlier if the team and the audience we have are confident in the game’s progress. Revenue shares are also a factor but will be largely influenced by the size of the team, weekly hours, resource management as well as certain legalities, so we will have to wait till the team size and roles are fully organized to determine exactly how these are divided. Legal paperwork is something that will wait to be reviewed until much farther into the project’s development cycle. Paperwork will be contracted by external sources. Paperwork will potentially factor in payment, asset entitlements and clauses such as significant contribution, leaving of team, project dissolution and disclosure. To get in contact with us if you are interested in becoming part of the team or any general inquiries feel free to message in the forum, PM me or email me at [email protected]. If you wanna come join the discord just to check the project out, talk about its features or access the demo just use the link below. Windows defender did not let my launch your game that i downloaded by going by the link and joining chat room with total strangers. One screenshot would do so much more. I have doubts about this project, you should have tried out jam game if you want to try out team and game development, this sounds like major financial project. Two artists is more than enough if you aim for small Steam/mobile releaset. You should specify what artist do you need if you want to avoid a discord graveyard of useless character portrait people. Thanks for the feedback Cobralad. Most firewalls will block the game that's currently uploaded since it isn't packaged as an installer yet, it doesn't really have the file size to require that. Also i did take longer than i should have to add some images, i was fiddling with imgur but they are set up now. Quick bump, currently we have gotten some great programming offers; but we are still looking to bring one more artist onto the team. The staff will be finalized in a few days so this is your last chance to get in! Note we are still very interested in anybody with programming skills. Developers with experience in designing flexible combat systems are very desired. I was commissioned to design the splash art and logo for the game and got to work together with the team for a bit. I just want to say that the team is very well organised with art direction and feedback. Communication is really good between programming, devs and artists - something I only rarely have seen with indie teams if I'm honest. I have faith in the team that they will be able to push through and have a finished, polished game in the end. If you're looking to join a passionate team but also want to work on something that will be actually released in the future, then I'd say go for it!